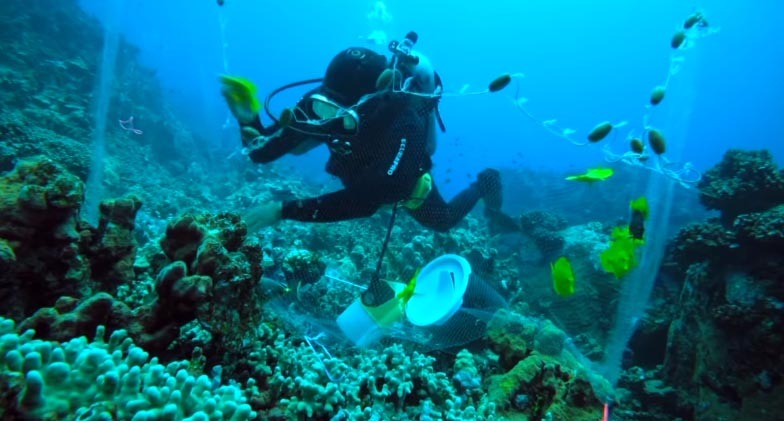 An aquarium fish collector in Hawaii size-sorts fishes trapped in a barrier net, releasing a Yellow Tang deemed too large for the aquarium trade. Video takes a look at the Hawaiian AQ fishery in action—and under the gun of actvivist protesters. 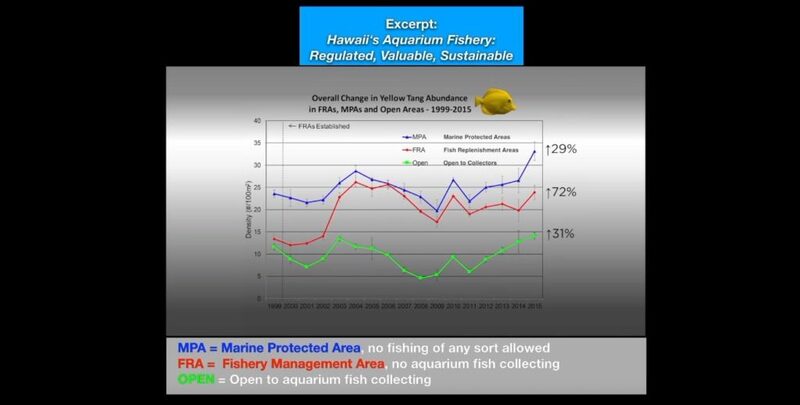 Of the many presentations that came out of MACNA 2018, one of the most-talked-about and first to be shared is Dr. Bruce Carlson’s look at the history and status of Hawaii’s Aquarium Fishery. Touted as one of the most sustainable and well-managed marine aquarium fisheries on the planet, it has come under fire repeatedly over the years. Carlson’s in-depth talk lays out the need for management, recognized as early as 1978. It evolves to explain the management plans called for in 1998 and enacted soon thereafter. You’ll come to understand the difference between Fish Replenishment Areas (FRAs, where aquarium fishing is prohibited, but fishing for food is not) and Marine Life Conservation Districts (MLCDs, aka Marine Protected Areas or MPAs, where no fishing of any kind is permitted). Carlson further explains how all these areas are routinely monitored, with data collection going back years. 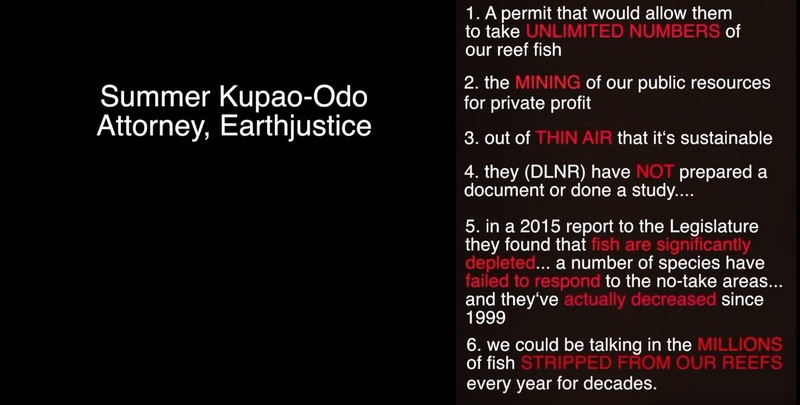 Carlson’s presentation also illuminates many of the other terms, organizations, and people you hear about in debates over the aquarium fishery in Hawaii. DLNR data illustrating the abundance of Yellow Tangs in MPAs, FRAs, and open areas. Carlson does an excellent job framing the debate over Hawaii’s Aquarium Fishery and explaining the current status of the fishery (which, among other things, explains how there can still be some fish collected and exported legally from certain parts of Hawaii, which is why you still see some fish showing up, albeit at higher expense and lower quantities than before). He illustrates how a relentless campaign of misinformation is being used to sway public opinion in favor of those whose greater aim is to end the practice of harvesting fish for aquariums around the globe. Statements made on Hawaii Public Radio by Earthjustice Attorney Summer Kupao-Ono. These statements are factually unsound and highly inflammatory. 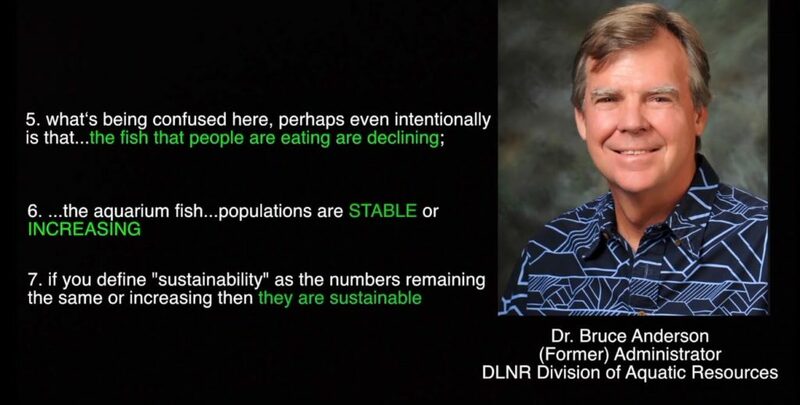 In a subsequent Hawaii Public Radio interview, Dr. Bruce Anderson, former Administrator with the Division of Aquatic Resources (DAR) at Hawaii’s Department of Land and Natural Resources (DLNR), points to the actual data in response to the allegations made by Earthjustice. Carlson is forced to close his presentation facing an uncertain future. While he is hopeful that data and science can win out, Hawaii’s aquarium fishery remains severely restricted at this time. Carlson offers some advice to all aquarists, which we’ll include here. The assault on the Hawaii Aquarium Fishery is a part of a much larger effort to stop the collection and import of all wild-caught marine life. Hobbyists (you!) and the industry need to be involved in multi-media and social media efforts to promote the benefits of your aquariums (educational, scientific, therapeutic, and economic) to a much wider audience outside of the hobby. Hobbyists, the aquarium industry, and public aquariums all need to support fisheries, like Hawaii’s fishery, that are well managed and sustainable, and do more to ensure that other fisheries are equally well managed and sustainable. I support the legitimacy of the different interesrs here. Reality changes are dictating restrictions to life extractive business. When the living natural systems are in general catastrophic collapse as is the case now, a reasonable position would be resist any further human meddling with the overall ecosystem. Perhaps it is instinctive distrust that our attempt to overthrow and replace the current apex predators in nature should give us pause. How’s it going for us so far? The data says 90% of food fish are gone. We are the only species of predator that selectively hunt and kill the largest trophies among our prey species. Unfortunately these are the very individuals that account for the great majority of a population’s reproduction. Continually removing the largest individuals is a selective pressure towards dwarfism, where the high capacity to reproduce is gone from the species, a step down the slippery slope to extinction. The reality is that the diversity of life here has arisen from need, where each individual is filling a conected role with a finely tuned ecosystem that can be seen as balanced and stable when the environment permits and stressed when it is unbalanced. Food fish in decline with ornamentals increasing is not a sustainable ecosystem as Carlson knows, which he why he conditions his faux conclusion with an imaginary definition of sustainabilty that obviously serves the collectors. Tropical marine species exist in especially complex networks of nutrient and gene flow in a sustainable ecosystem. Each part relies on an equilibrium state with the other component life forms, ultimately within a state of biocontrol by the apex predator functions, generally culling less “fit” individuals. This is where we fail miserably. We need to think and act much more pro-habitat and ecosystem stability if we are to survive. Meantime let’s rear some amazing ornamentals in hatcheries and find ways to improve and increase habitat where natural processes have respite from our incompetence. Bravo Dr Carlson. From by reading, your opinions are shared by many highly qualified researchers in this matter … sans commercial interests. We thank you Mr Carlson for your unending truith about our fishery here in Hawaii nae. It has been a Very Sustainable fishery for the whole time I have been here,27 years. The numbers of fish counted every year,just goes up,even with the collecters taking 2 millon small fish a year. Well now that we have had no take in west hawaii for 2 years the population will be allmost to many for the reef to sustain since there is no human take. Just like the fishery in southern California the take of sea urchins must coincide with the growth of the kelp. We now see sea urchins devastating the kelp beds there. We can live in a clean harmony with nature. First we must study and understand her ,and then make informed choices about ,what ,when and size and how many is sustainable to harvest. This has been well thought out in Hawaii. It is still one of the most studdied and Sustainable resources we have here in Hawaii. We have lived in harmony with the tourist dive industry here for 20 years. Making sure the industry makes no impact in the areas the divers go to. Thats why 30% of the west cost is off limits to all fropical fish collecting. The rest of the Big Island is to rough and remote to harvest for tropical fish, so it stands as an almost untouched area supporting many super large adult breading pairs of all kinds of fish. We will have plenty of fish on the Big Island for many generations ,as long as we continue to fish it the way we have in the past. Many of the deeper fish like the bandit angel are a 140 ft + and deeper fish. These fish have been seen in huge schools in 200- 300 ft of water, we see only the population pushed shallower do to overcrowding in the depths. We face many challenges to help save our corals from heat death here as well as many reefs worldwide. Please support our ongoing coral saving efforts. Bravo Dr Carlson. From by reading, your opinions are shared by many highly qualified researchers in this matter ... sans commercial interests. I support the legitimacy of the different interesrs here. Reality changes are dictating restrictions to life extractive business. When the living natural systems are in general catastrophic collapse as is the case now, a reasonable position would be resist any further human meddling with the overall ecosystem. Perhaps it is instinctive distrust that our attempt to overthrow and replace the current apex predators in nature should give us pause. How's it going for us so far? The data says 90% of food fish are gone. We are the only species of predator that selectively hunt and kill the largest trophies among our prey species. Unfortunately these are the very individuals that account for the great majority of a population's reproduction. Continually removing the largest individuals is a selective pressure towards dwarfism, where the high capacity to reproduce is gone from the species, a step down the slippery slope to extinction. The reality is that the diversity of life here has arisen from need, where each individual is filling a conected role with a finely tuned ecosystem that can be seen as balanced and stable when the environment permits and stressed when it is unbalanced. Food fish in decline with ornamentals increasing is not a sustainable ecosystem as Carlson knows, which he why he conditions his faux conclusion with an imaginary definition of sustainabilty that obviously serves the collectors. Tropical marine species exist in especially complex networks of nutrient and gene flow in a sustainable ecosystem. Each part relies on an equilibrium state with the other component life forms, ultimately within a state of biocontrol by the apex predator functions, generally culling less "fit" individuals. This is where we fail miserably. We need to think and act much more pro-habitat and ecosystem stability if we are to survive. Meantime let's rear some amazing ornamentals in hatcheries and find ways to improve and increase habitat where natural processes have respite from our incompetence.